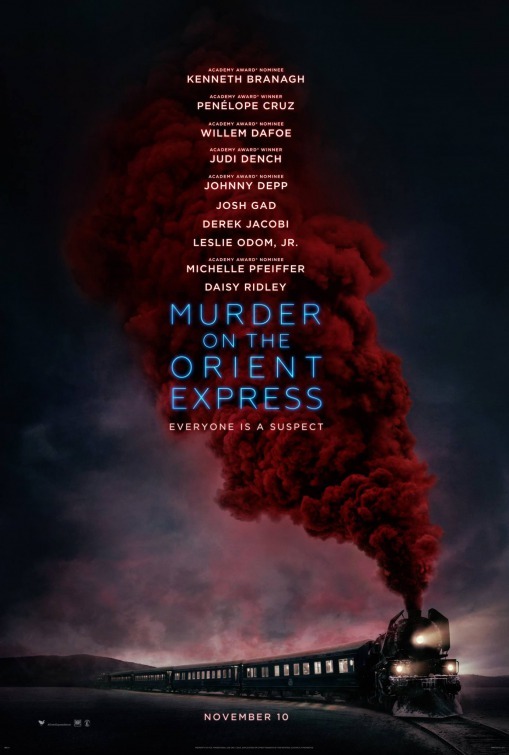 Director Kenneth Branagh assembles an all-star cast for this week’s Murder on the Orient Express, an adaptation of the classic Agatha Christie mystery of the same name. 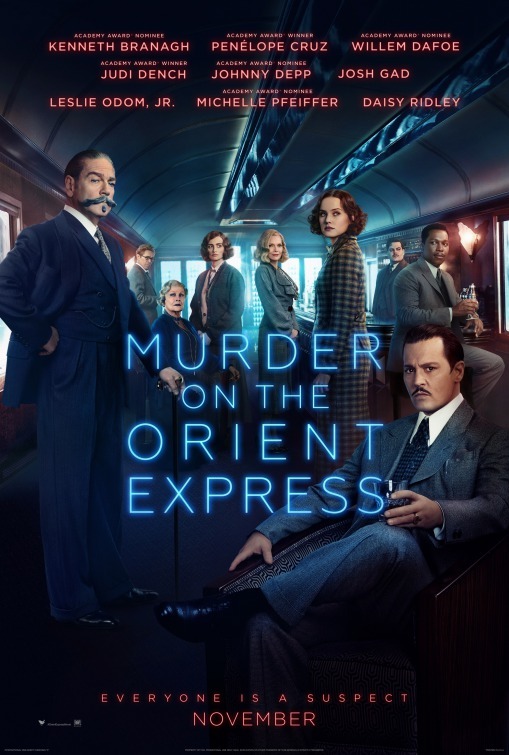 Branagh himself takes on the role of Christie’s famous detective Hercule Poirot, who finds himself on a train running through parts of the Middle East and surrounding areas. Along on the ride are over a dozen other passengers, not to mention crew. When one of those passengers, Edward Ratchett (Johnny Depp) is killed, Poirot uses the time available to him to investigate who the murderer might be from a collection of society figures and others. Daisy Ridley, Penelope Cruz, Judi Dench, Leslie Odom Jr., Michelle Pfieffer, Josh Gad and others all play the assembled passengers/suspects. “Everyone is a suspect” we’re told on the first poster, which is quite a statement considering the impressive cast list that’s on display. The primary image is of a train speeding along the track, with oddly red smoke pouring out of its stack. The theatrical poster does inside to the interior of the lounge car, the various characters arranged around the inside of that car, some with a drink in hand and all glancing purposefully somewhere. Each member of the impressive cast, as well as the substantial supporting cast, was featured individually on their own character poster, some shown inside the train and some outside. The first trailer sets the stage of being set on a train trip through the wilderness. We get some narration about how interesting the forced-collection of strangers into a confined space can be. Seen we hear a passenger has died and we see the roles each passenger will take on. All of them are a suspect and we finally meet Hercules Pirot, who introduces himself as the greatest detective in the world. It’s short but it’s to the point, selling the all-star cast being involved in a murder mystery. The second trailer is no less focused on the cast being a major selling point but also has more of the story to offer. A conversation between Pirot and the gangster played by Depp provides a framing device to show how the detective’s investigation expands to involve everyone aboard. That’s good, but there’s also a lot of shots here of trains derailing and other action sequences that seem designed to assure audiences it won’t all be thinking. I get the sense the studio is trying to dumb it down a bit, at least here in the marketing. A photo of the room Ratchett was killed in is used on the front page of the movie’s official site, which has a notable domain name, the victim’s own feet visible at the bottom of the image, which keeps bouncing around like the train is still moving. Some of the objects scattered around the Crime Scene are clickable, bringing up a closer look and a text box where you’re supposed to write notes about that piece of evidence. Those Clues were scattered throughout the marketing and publicity campaign and are assembled in that section of the site, though with no further guidance or hints as to what they might be. The Suspects section then has pictures and names for all the passengers and others on the train who are being investigated and evaluated for their role in the murder. By logging in to the site (using your Facebook credentials) you can track your progress in solving the mystery. There are also links encouraging you to Get Tickets as well as follow the movie’s Facebook, Twitter and Instagram profiles. The first TV commercial sells a high-tension thriller involving multiple suspects trapped in tight quarters, making sure to show off the all-star cast and with music that adds to the suspense and sense of urgency involved in finding the real killer in a sea of motives. Further TV spots would hit slightly different beats but all sell the same basic idea. Some of those commercials wound up being used as promoted posts on Twitter and pre-roll spots on YouTube. Other online ads used the key art of the star-studded cast as well as short video clips. There were also at least a couple brand that helped with promotional efforts. Godiva released a number of movie-themed collections of chocolates and other sweets and ran a sweepstakes awarding a train trip through California’s Napa Valley. HSN meanwhile offered a bunch of fashion items inspired by both the look of the movie and the time period the story takes place in. While there was certainly coverage of the movie during production, the first big push was kicked off by a cover story in Entertainment Weekly that included first look photos of the cast, comments from Branagh about the production and the ensemble that was assembled and much more. That came around the same time as a big press event in London where the cast was brought together and talked about the movie while the studio showed off a bit of footage. A first look photo in EW’s fall movie preview was accompanied by a brief interview with Branagh where he talked about how he had the cast shoot one of the movie’s most difficult sequences on the very first day of filming. A later feature profile of Pfieffer focused on this and other upcoming or recent movies that mark the return to regular work for the actor, who talked about shooting such a star-studded production and why she’s taken a few breaks over the last decade. The New York Times did a similar feature interview. Later on there was a profile of Branagh that talked about the big year he’s having in a number of films and stage productions, this included. The director/star also did the media interview rounds on TV and in print to talk about the movie and taking on such a well known story. First off, it has to be noted that like this week’s Daddy’s Home 2 this movie features some problematic casting, particularly as the media’s attention is turned to sexual harassment and toxic masculinity in the entertainment and other industries. That Johnny Depp is not only in the movie but featured so prominently in the marketing (though not in the publicity) shows there are no real consequences for domestic abuse or other behavior if you’re white, male and popular enough at the box-office. Perhaps that’s why so much of the publicity has focused, with the exception of Branagh, on both Ridley (partly in conjunction with her Star Wars notoriety) and Pfieffer, who’s enjoying a much-needed career resurgence. Putting that to the side, the rest of the campaign sells a movie that may be based on an old musty book today’s young people may have seen on their grandmother’s family room shelves but never picked up as a slick, colorful, energetic thriller. From the neon lighting that’s shown on the posters to the Imagine Dragons tracks used in the trailers and the pacing of the TV spots, the studio is working hard to liven up the story and make it appear to be the polar opposite of a dry, slow thriller. It’s action-packed, the campaign promises, and filled with stars you’ve already enjoyed.